Revista Laboratorio Nro. 6 was published last week out of the School of Literature at the Universidad Diego Portales in Santiago, Chile. The journal includes essays, interviews, sound poetry, visual poetry, and (for want of a better description) page poetry. I have two poems in the journal's Creacion section: THREE SENRYŪ BY GOOD STICKYTAPE MONSTER and Duck Part 1. 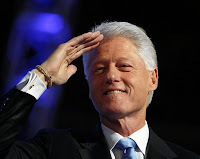 In other news, Bill Clinton supports human interstellar travel, as do I.